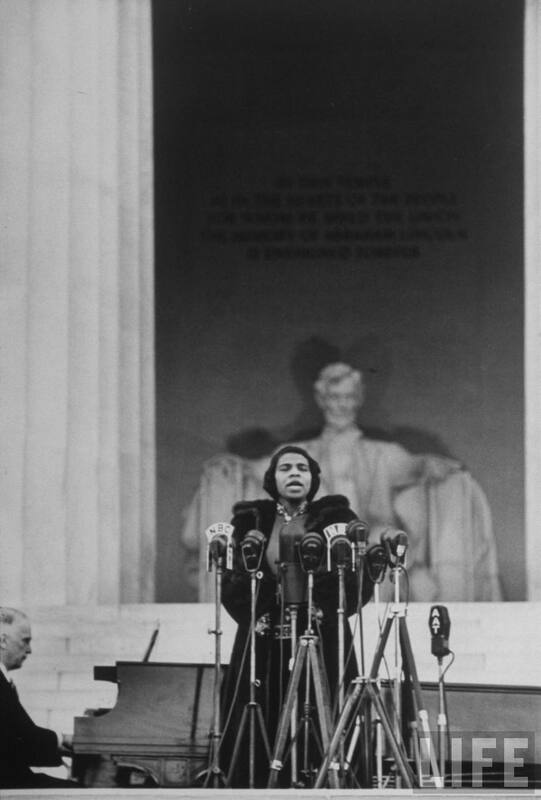 Celebrated as one of the greatest singers of her time, Marian Anderson used her prodigious talents to break racial barriers in American art and culture. In Philadelphia, Pennsylvania, she was born on February 17, 1897, the first of three daughters. Her father, a deliveryman, died of a brain tumor when Marian was 12. Five years later, her mother became seriously ill, leaving Marian with the burden of her family’s financial support. Anderson’s musical talents emerged early. As a child, she taught herself to play the family piano and did odd jobs to buy a violin from a pawnshop. At six, she joined the choir at the Union Baptist Church, and at eight, she performed her first solo. She awed the congregation with both her rich voice and extraordinary range. As a teenager, Anderson tried to attend a local music school, but was turned away because she was African American. The members of her church then raised funds to pay for the services of Giuseppe Boghetti, a professional vocal coach. Boghetti introduced her to classical music and became the most important of Anderson’s many teachers. 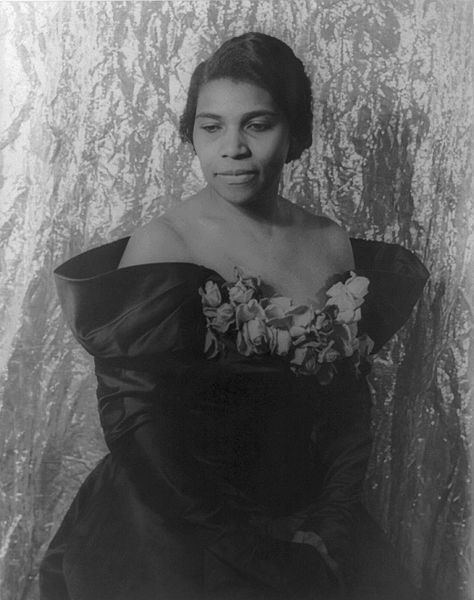 Well-established on the African-American church circuit, Anderson made her New York debut at Town Hall in 1924. The recital was a profound disappointment: The turnout was modest, and the reviews were unenthusiastic. Anderson was so devastated that she considered giving up her singing career. The next year, however, she triumphed at a National Music League competition, beating out more than 300 other aspiring classical singers. As her prize, Anderson performed a solo at the New York Philharmonic. Her success, however, did little to advance her career. Anderson’s race continued to keep her from finding bookings in theaters catering to white audiences. In 1931, Anderson was awarded a grant from the Julius Rosenwald Fund to study in Europe. There, she found whites much more receptive to her singing. From 1933 to 1935, Anderson toured widely, visiting Scandinavia, France, England, Italy, Austria, and Spain. Her enormous repertoire included 200 songs in nine languages. In each performance, she combined classical works with spirituals she had first learned in church. Anderson soon emerged as a star, earning accolades wherever she performed. Most memorably, composer Arturo Toscanini, on hearing Anderson sing in Austria, told her that “Yours is a voice such as one hears once in a hundred years.”Equally impressed was American impresario Sol Hurok. After seeing Anderson in concert in Paris, he asked to manage her on a tour through the United States. Although so far her talents had been given their due only in Europe, Anderson welcomed the chance to return home. In 1935, Anderson again performed at New York’s Town Hall, this time to great acclaim. Her extensive tours were equally successful. Booked two years in advance, her concerts were sold out across the United States. In 1936, she became the first African American to perform at the White House. Two years later, Hurok attempted to book a concert at Washington, D.C.’s Constitution Hall, which was owned by the Daughters of the American Revolution (DAR). The organization toldHurok the dates he wanted were not available. However, the real reason for DAR’s refusal was clear: It did not want to allow an African American to perform in the hall. Expressing the outrage of many, First Lady Eleanor Roosevelt resigned from the DAR in protest. Secretary of the Interior Harold Ickes offered Anderson an alternate location for her Washington concert: the steps of the Lincoln Memorial. On April 9, 1939, Anderson performed for a crowd of 75,000, while another 2 million listened to the concert on the radio. The performance finally made Anderson a star in her native country. It also made her into icon in the fight against racism. A mural commemorating the event was unveiled at Department of the Interior headquarters in 1943. Now a celebrity, Anderson was more in demand than ever as a concert singer. A year after marrying Orpheus H. Fisher, an architect, she broke the attendance record at Los Angeles’s Hollywood Bowl in 1944. In 1952, she made her television debut on The Ed Sullivan Show. Fulfilling a lifelong dream, Anderson became the first African American to sing at New York’s Metropolitan Opera House in 1949. Although, at 52, Anderson was past her prime, the performance inspired eight curtain calls. Her foray into opera would open doors for LEONTYNE PRICE and many other young African-American opera singers. Anderson sang at the inaugurations of presidents Dwight D. Eisenhower and John F. Kennedy before her retirement in 1965. Throughout her long career, she was given an array of honors. In addition to 24 honorary doctorates, Anderson was presented with the Presidential Medal of Freedom in 1963 and a Kennedy Center Honor in 1978. She also received a Grammy Award for lifetime achievement in 1991. Respected both for her prodigious talent and her grace under pressure, Marian Anderson died two years later, on April 8, at the age of 97. Anderson, Marian. My Lord, What a Morning. New York:Viking, 1956. Keiler, Allan. 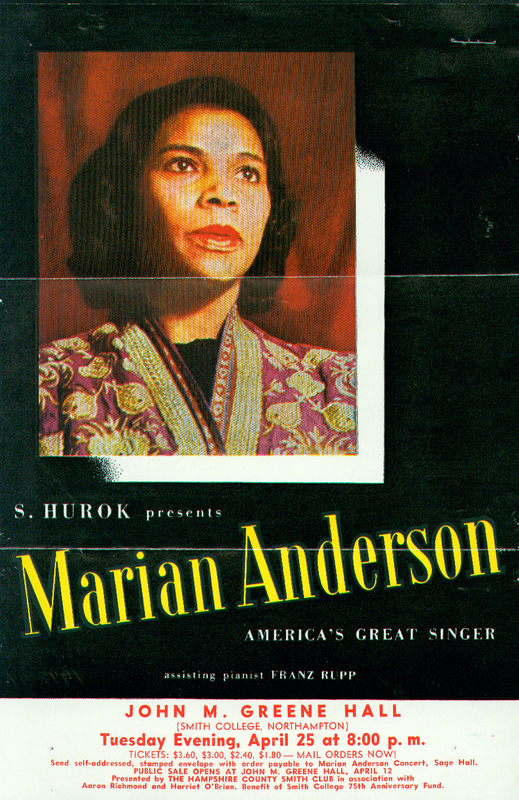 Marian Anderson: A Singer’s Journey. New York: Scribner, 2000. 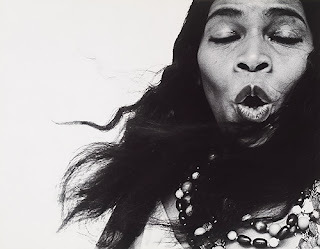 Marian Anderson: Bach, Brahms, Schubert. RCA, CD, 1989. Schubert and Schumann Lieder. RCA, CD, 2000.